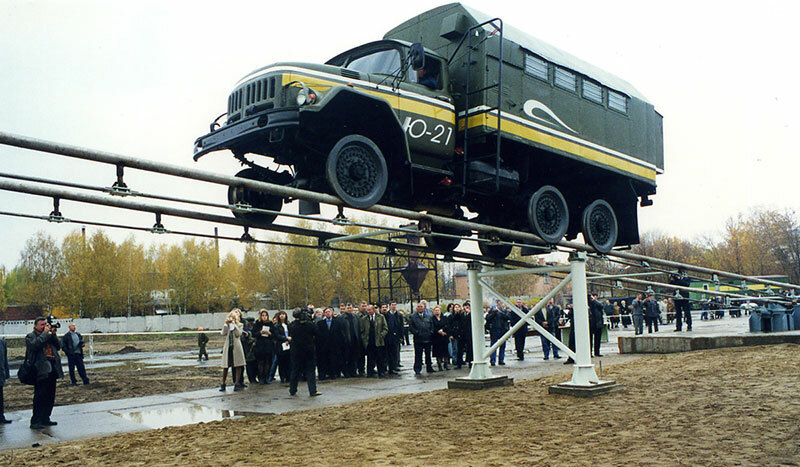 In 2001 in the town of Ozyory of Moscow region the first ever test site for SkyWay technology was built, which set the impulse to further development of SkyWay transportation. 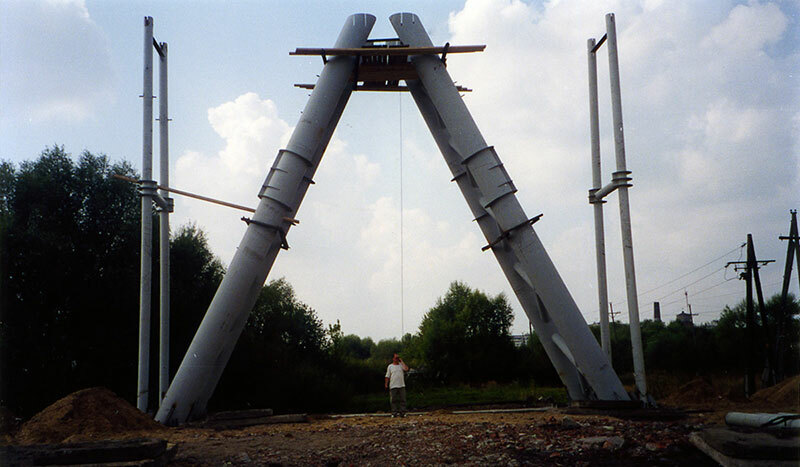 Pilot tests of a track structure of the 150-meter UST facility were held in October 2001. The order of testing was led by the author of the UST program Anatoly Yunitskiy, General Director, General designer of the "Yunitskiy Scientific and Production Company". Pilot tests were successful, confirming the correctness of technical solutions pledged by the author in the project. 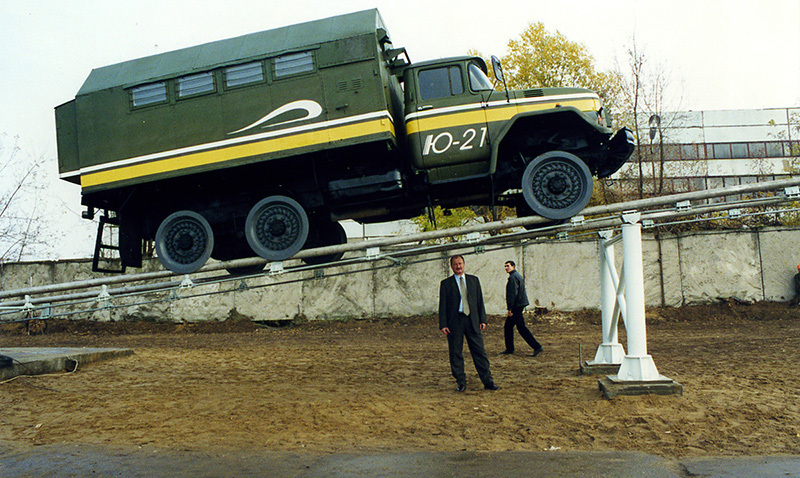 A truck ZIL-131 as was used a testing module. 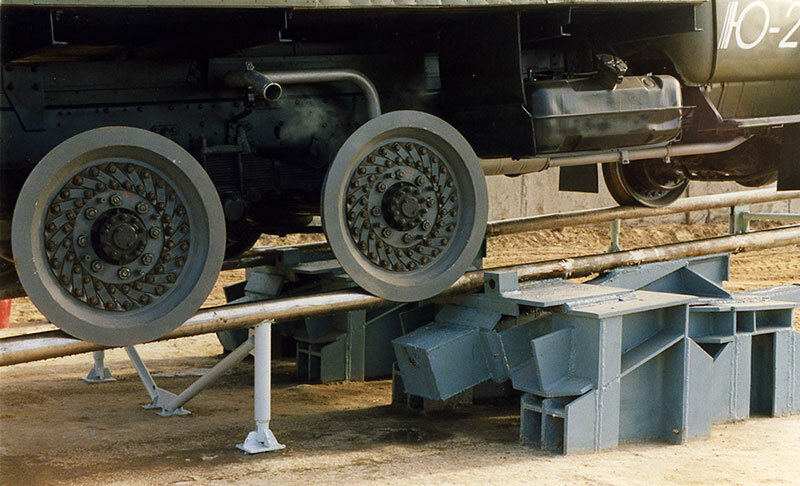 Its wheels were specially adapted for UST track structure. Representatives of the Russian TV channel RTR attended the tests. 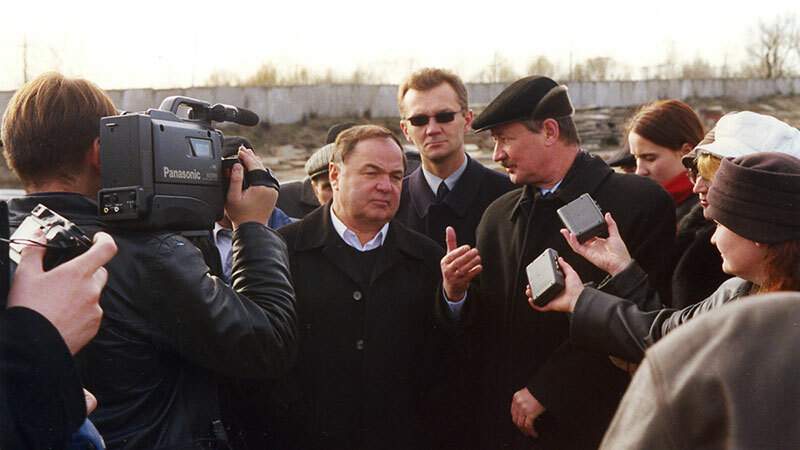 They filmed a video that was shown in the news program "Vesti". 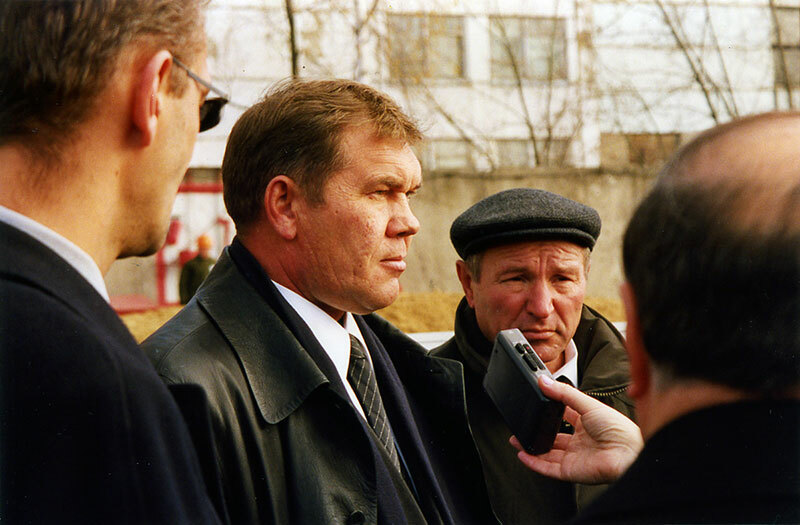 The construction of the test site was done by the order of the Administration of Krasnoyarsk Region and personally its Governor Alexander Lebed. 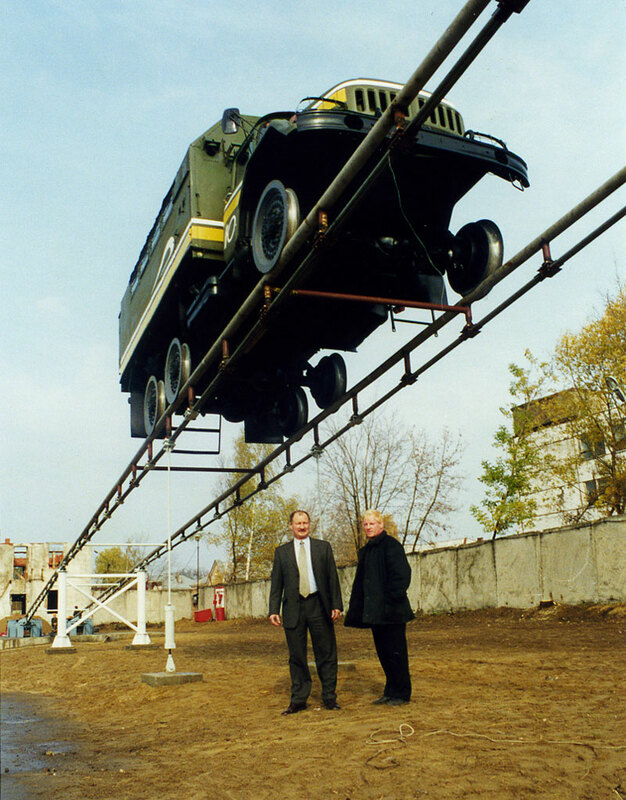 The "Yunitskiy Scientific and Production Company" headed by the General director - General designer Anatoly Yunitskiy, acted as the General designer, General supplier and General contractor of works on construction of the test site, where the first generation of SkyWay technology for the transportation of goods was implemented. 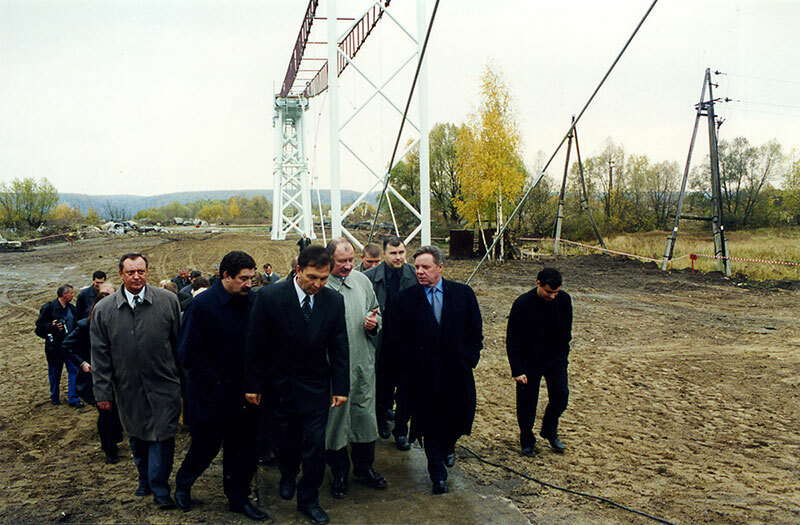 The joint activity of experts from different countries to establish a full-scale test site of the first generation of SkyWay technology has allowed to solve the most difficult complex of works in record time - within 9 months from the initial design of the facility to its operational commissioning. 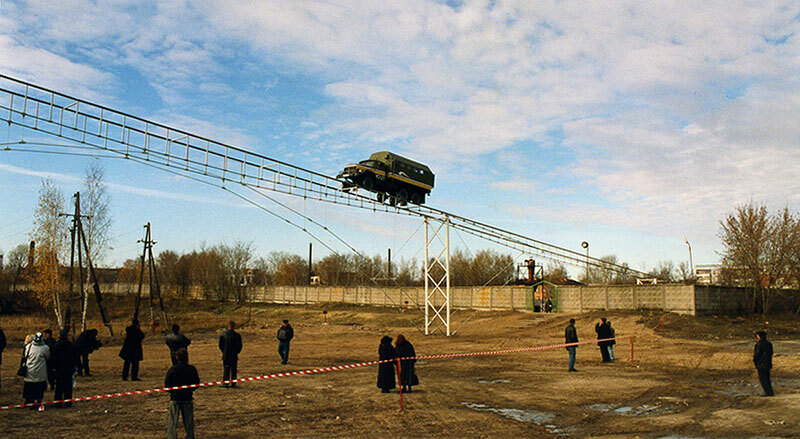 The official presentation of the SkyWay transport test site took place in October 2001. At the presentation the customers, the media and the public were offered an introductory demonstration of the basic principles of SkyWay transport on the example of an experimental section, as well as main technical solutions of the first generation of this technology. It was nice to see among the honored guests at the presentation the Governor of Moscow region Boris Gromov, the Governor of Krasnoyarsk region Alexander Lebed and the President of the Republic of Adygea Hazret Sovmen, who expressed words of encouragement and support to the project author. The presentation clearly and convincingly demonstrated to the organizers and participants the performance and viability of the innovative transport system. TV channels - "RTR", "TV-6" and "Culture". 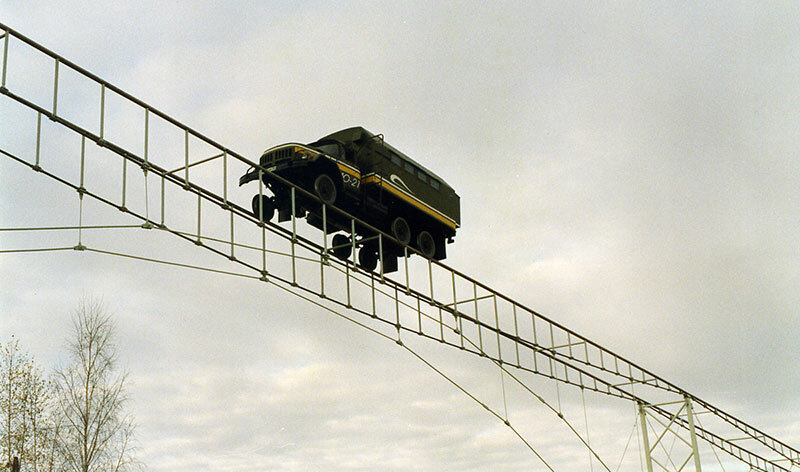 The world's first experimental section of SkyWay transport was a full-scale fragment of the SkyWay transport system with a length of 150 meters, with a height of supports up to 15 m, length of maximum span of 48 m and rolling load weight up to 15 tons. 4 - supporting ropes; 5 - tube-rail; 6 - tension cables; 7 - postings. relative stiffness of spans at rated load - from 1:400 (11.1 m span) to 1:1500 (48 m span). 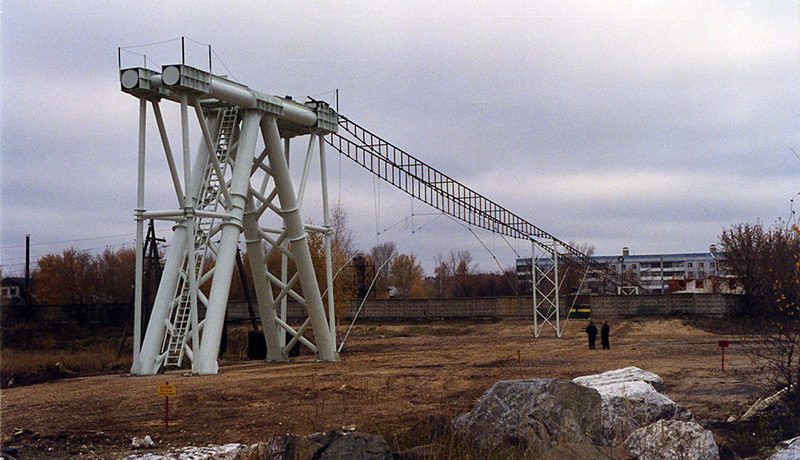 As a result of comprehensive testing the developer has received calculated data to perform design and survey work for commercial production of the SkyWay rail overpass, intermediate and anchor supports, cargo and passenger rolling stock, as well as on the development of specific passenger and freight routes based on SkyWay technology. 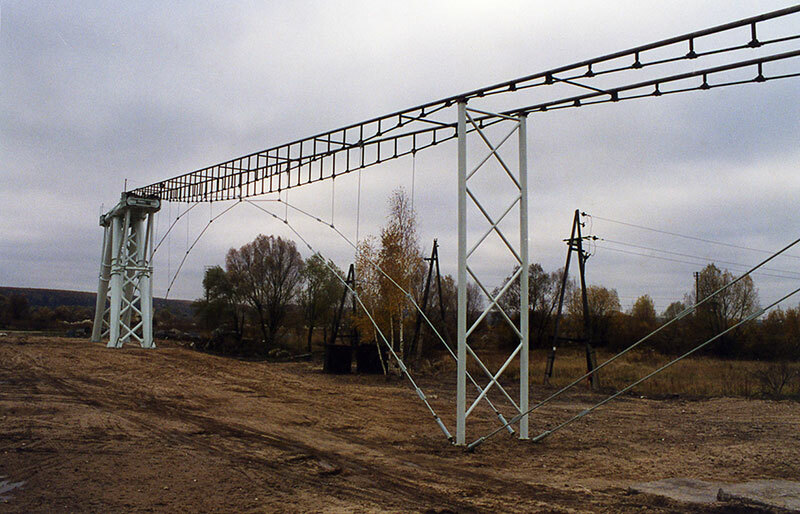 On the test facility carried out were approbation of engineering design works, construction technology, static and dynamic loading of the span superstructures by the calculated rolling load and influence of natural and climatic factors on the pre-stressed continuous and statically indeterminate transport overpass. 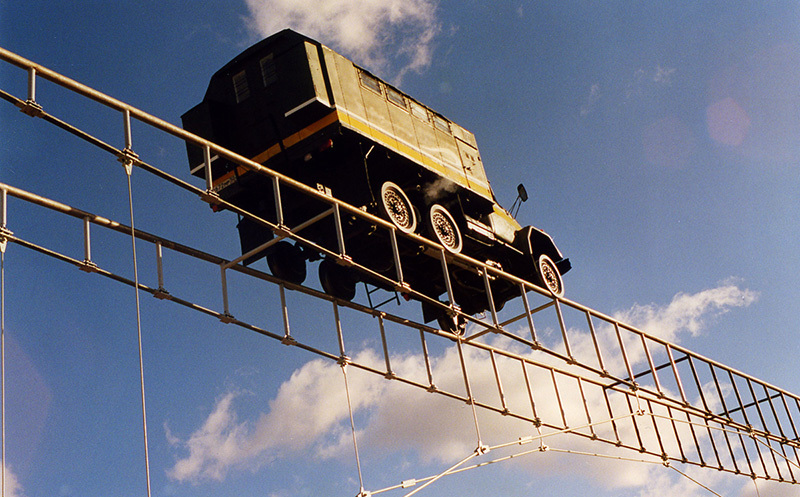 There were developed technologies of operation, maintenance and repair of the SkyWay rail track, created dozens of inventions and over a hundred of patentable know-how. 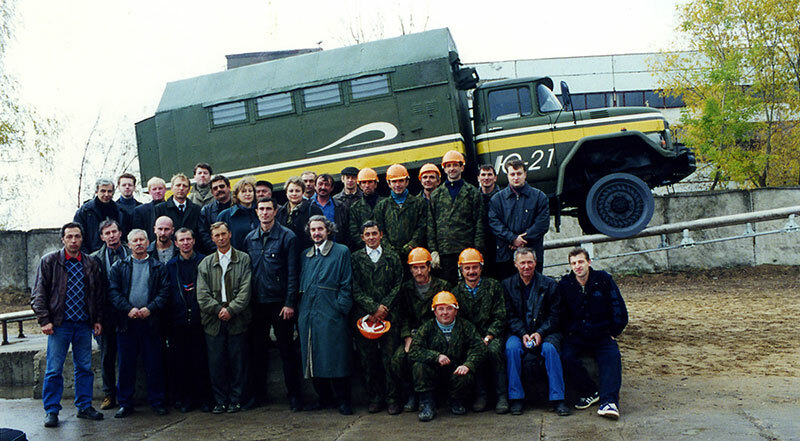 Hundreds of tests and experiments were conducted at the site, their results are summarized in a scientific report, numerous expert opinions were obtained and the "Yunitskiy Scientific and Production Company" was awarded three gold medals of quality Mark of "Russian Brand" in the following categories: "Technology of string transport", "Project of passenger module" and "Project of cargo module". The test site of SkyWay transport has attracted the interest of the world community and received the support of the United Nations. 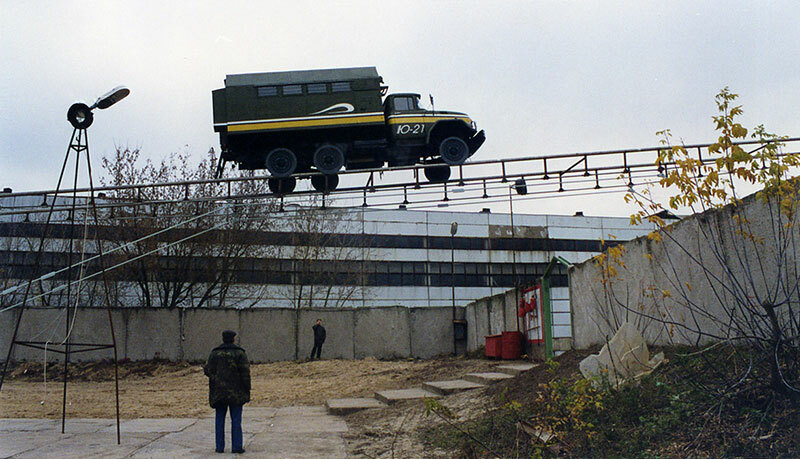 Thanks to the creation of the test site the second UN grant was received - FS-RUS-02-S03 "Provision of Sustainable Development of Human Settlements and Urban Environment Protection through the Use of the String Transportation System". The main result of the work on the test site in the town of Ozyory is the development of SkyWay transport of future generations.